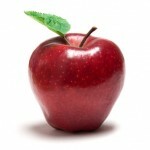 HomeDrugs and HealthDoes An Apple A Day Keep Statins Away? Does An Apple A Day Keep Statins Away? In a previous “Health Tips From the Professor” I talked about how difficult it has been to prove that statins significantly reduce the risk of heart attack or cardiovascular deaths in a low risk population group. Now let’s look at the other side of the coin – lifestyle change –and ask how effective lifestyle change is at reducing the risk of cardiovascular disease. You’ve all heard the saying “An apple a day keeps the doctor away”. It dates back to Victorian England. It was the public health message of the day – much simpler and more concise than our current food guide plate. A prominent British doctor and his research team recently decided to see how accurate that saying really was. But they took their study one step further. They compared the effectiveness of an apple a day versus a statin a day at reducing the risk of cardiovascular deaths (Briggs et al, British Medical Journal, 3013;347:f7267 doi: 10.1136/bmj.f7267). The results of that comparison may surprise you. They used the data from the Cholesterol Treatment Trialist meta-analysis to estimate the effectiveness of statin drugs at reducing cardiovascular deaths. They used the data from the PRIME comparative risk assessment model to estimate the effectiveness of apple a day at reducing cardiovascular deaths. They asked what would happen if each of them were the primary intervention for the entire British population over 50 who were not currently taking statin drugs (17.6 million people). They assumed a 70% compliance rate for both interventions. In simple terms that means they assumed that 70% of the population would actually do what their doctors told them. (Patients must be more compliant in England than in the US). Giving a statin drug each day to 17.6 million people would reduce the number of cardiovascular deaths by 9,400. Giving an apple each day to the same 17.6 million people would reduce the number of cardiovascular deaths by 8,500 (not significantly different). But when they looked at side effects and cost the two interventions were significantly different. On the other hand, there are no known side effects to an apple a day. The statin intervention would cost an estimated $295 million. In the case of apples, you would presumably be substituting a more healthy food for a less healthy food so there would be little or no net cost. And the 70% compliance rate is probably wildly optimistic. Some experts have estimated that up to 50% of patients discontinue their statin medications within the first year because of side effects or cost. Is There A Scientific Basis For Those Estimates? Of course, we all know that the “apple a day…” saying was never meant to be taken literally. It was just a simple way of saying that a good diet will reduce the risk of disease. It turns out that there was another major study on the effect of dietary fiber on reducing the risk of cardiovascular disease in the very same issue (Threapleton et al, British Medical Journal, 2013;347:f6879 doi: 10.1136/bmj.f6879). It was a meta-analysis that combined the data from 22 previously published studies. For every 7 g/day increase in dietary fiber the risk of both heart attacks and cardiovascular disease decreases by 9% (7 grams of dietary fiber could come from one serving of whole grains plus one serving of beans or lentils or from two servings of fruits or vegetables). For every 4g/day of fruit fiber (equivalent to one apple) the risk of heart attacks decreases by 8% and the risk of cardiovascular disease decreases by 4%. The numbers are similar for every 4 g/day of vegetable fiber. Another recent study showed that consumption of 75 g/day of dried apple (equivalent to two apples a day) lowered total cholesterol by 13% and LDL-cholesterol by 24% in post-menopausal women (Chai et al, J. Acad Nutr Diet, 112: 1158-1168, 2012). That’s comparable to the cholesterol reduction achieved with statin drugs. If you have not previously had a heart attack and are at relatively low risk, something as simple as adding an apple a day (in place of less healthy foods) may just as effective as statin drugs at reducing your risk of cardiovascular death without the side effects and cost of the drugs. This is not really new information. For years both the American Heart Association and the National Institutes of Health have recommended that Therapeutic Lifestyle Changes (weight loss, healthy diet and exercise) should be tried BEFORE drug treatment to reduce the risk of heart disease. So if you want to avoid statins, tell your doctor that you are willing to make the needed lifestyle changes to reduce your risk of heart disease and stick with it. Lifestyle changes are hard, but clinical studies clearly show they can often be just as effective as drug therapy, without the cost and side effects. Don’t misunderstand me. I’m not advocating avoiding statin drugs if they are absolutely necessary. If you have had a heart attack or are at high risk of heart disease, it is clear that statins can save lives. Even here I would recommend talking with your physician about incorporating therapeutic lifestyle change into your regimen. It may allow them to minimize the dose, and therefore the side effects, of the statin drugs.